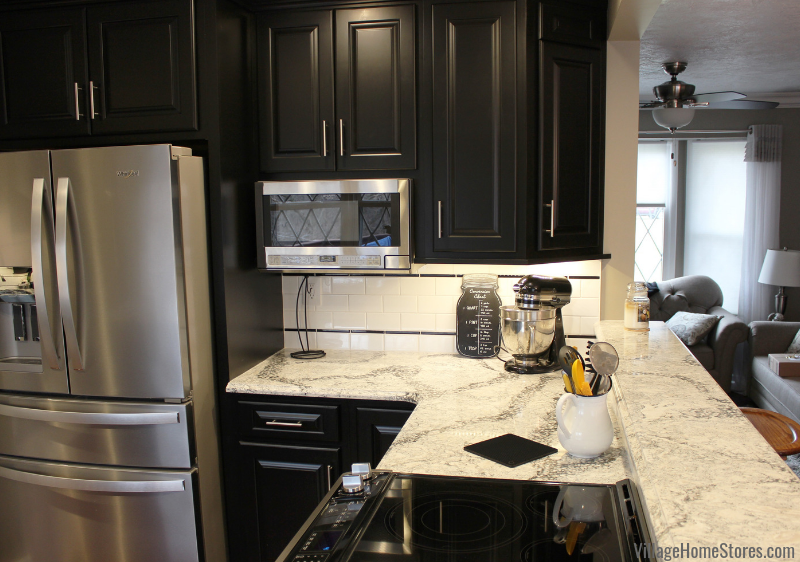 Rock Island, IL- A Kitchen Customized But Not Resized! 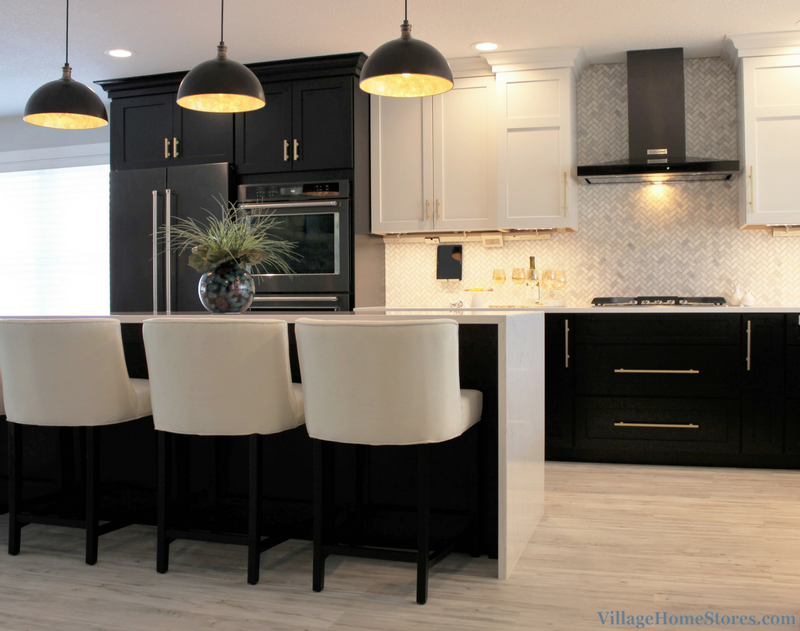 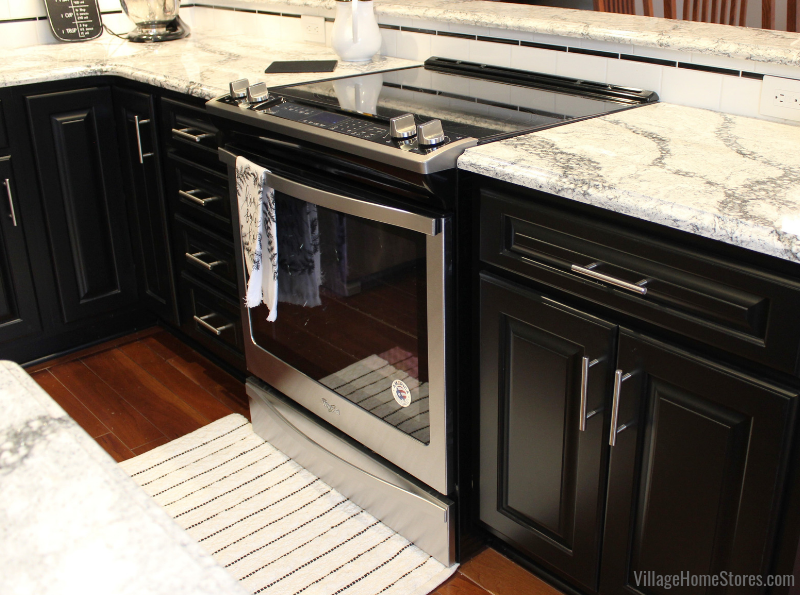 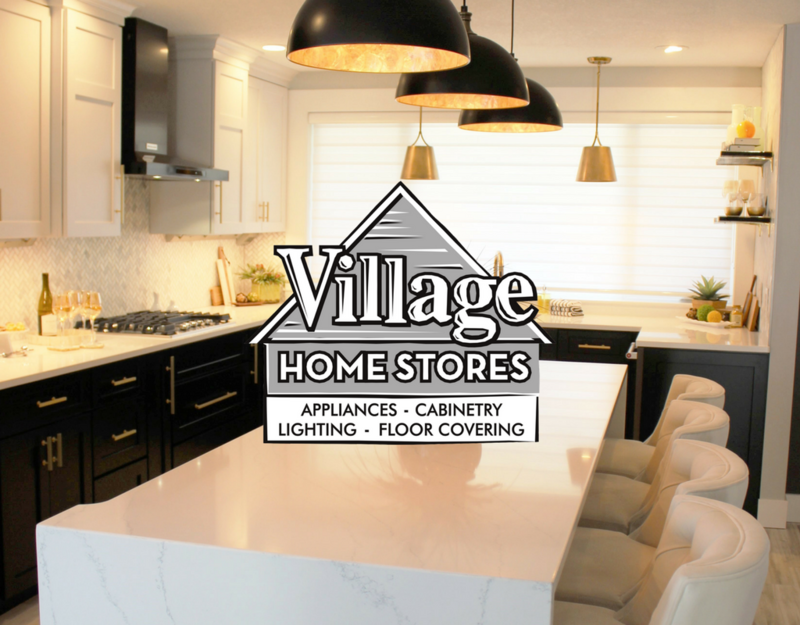 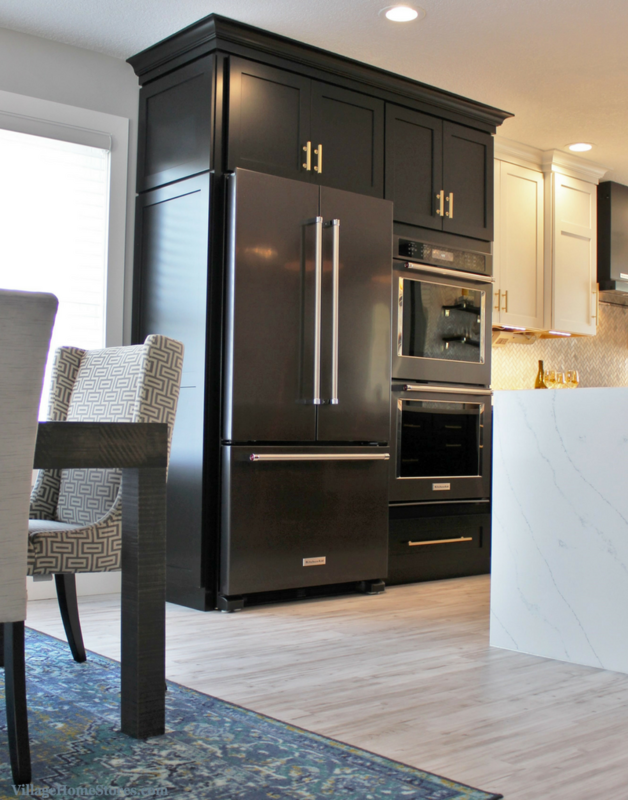 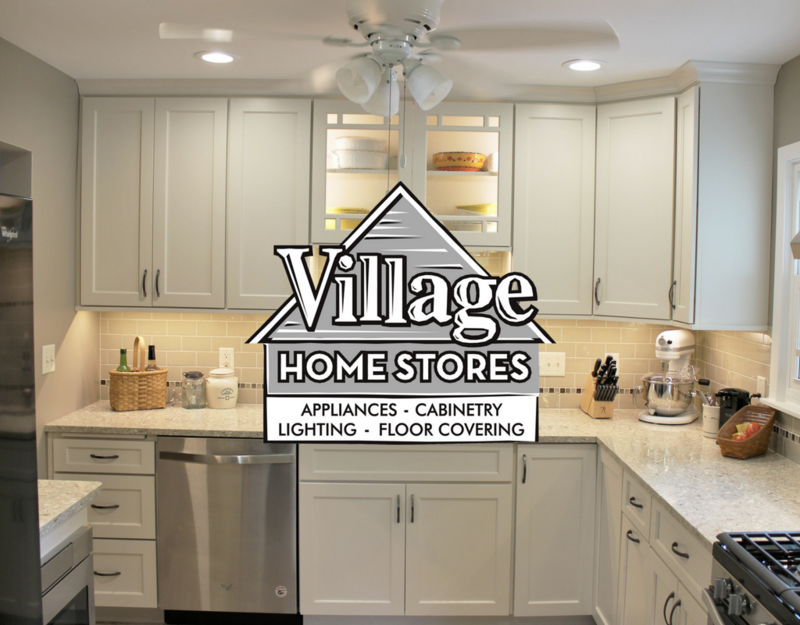 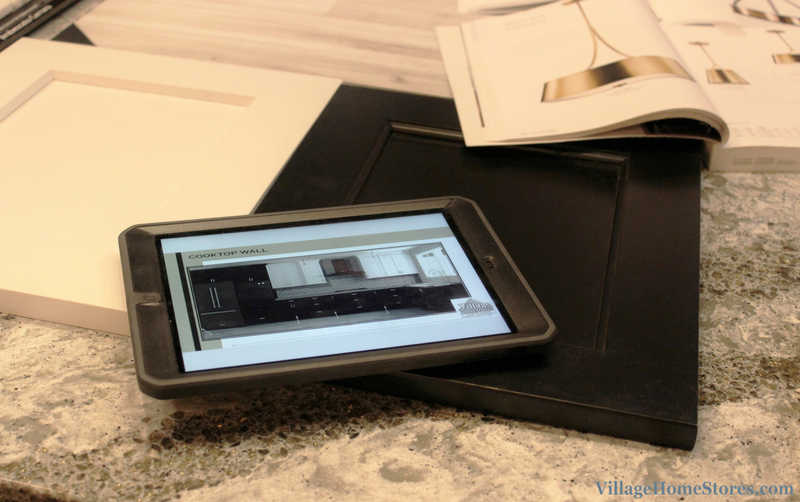 Village Home Stores is completely capable of having a wall removed or opened up to create a beautiful new space for your kitchen. 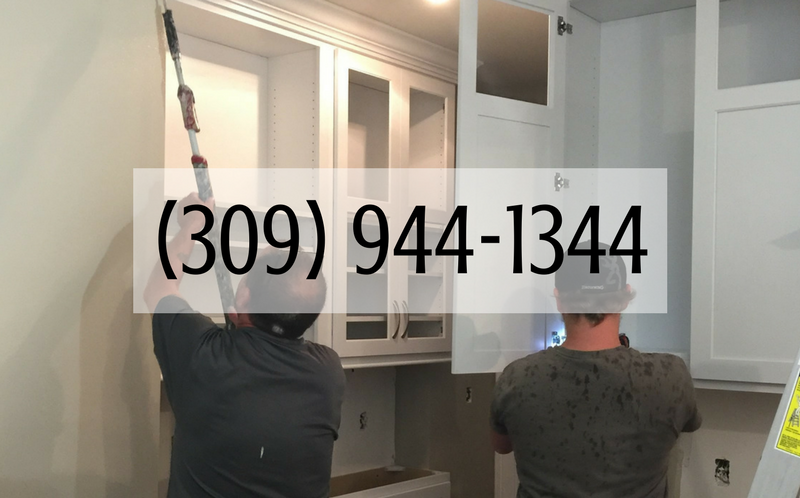 Many of our full project management remodel projects involve some kind of wall work like that….but not every project. 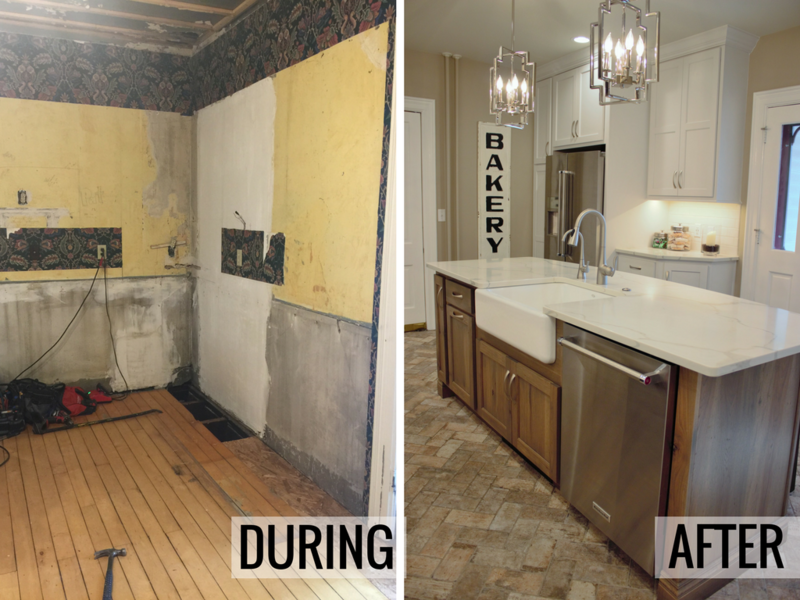 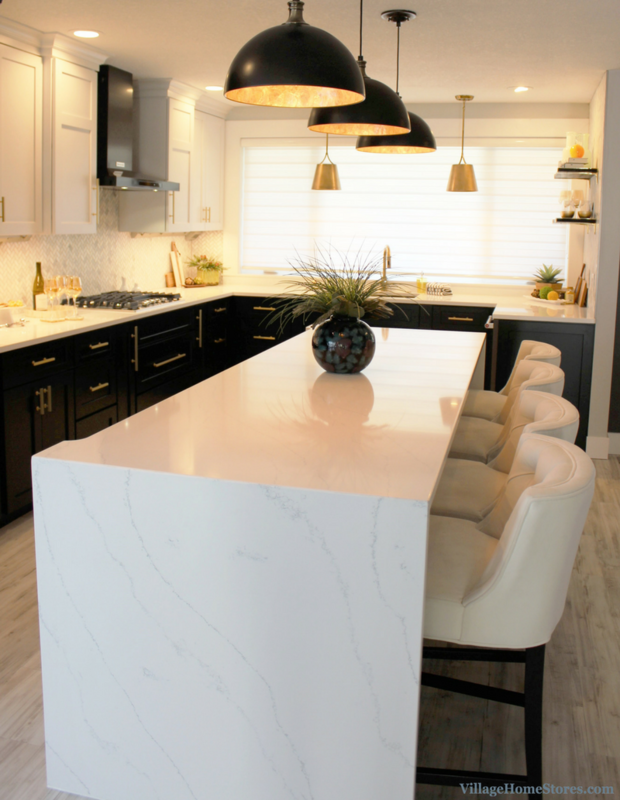 This Rock Island, IL kitchen remodel is a wonderful example of how you do not need to make drastic changes to the room to still get a winning result! 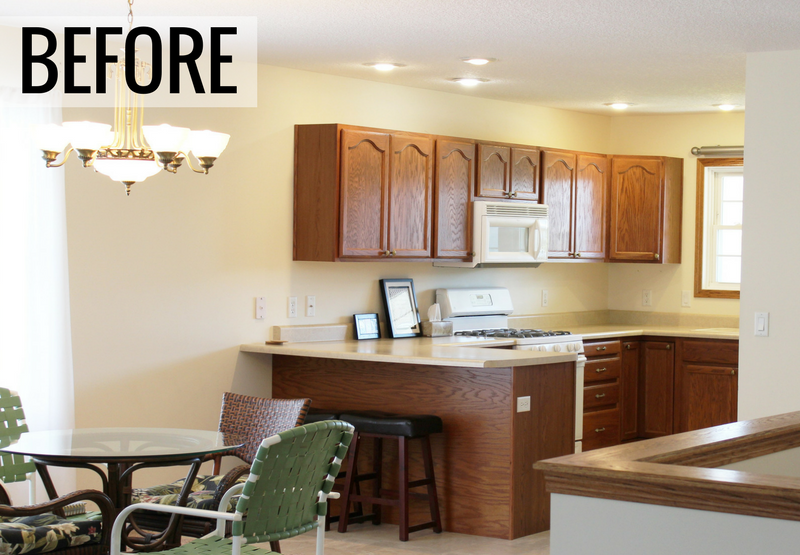 This kitchen was remodeled and only the soffits above the cabinetry were removed. 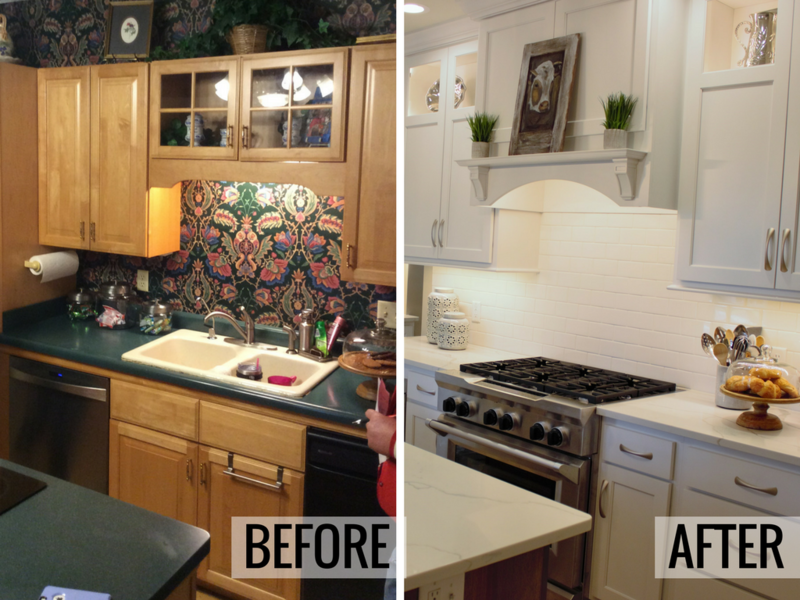 But seeing the before and after transformation you would think this was an entirely different home! 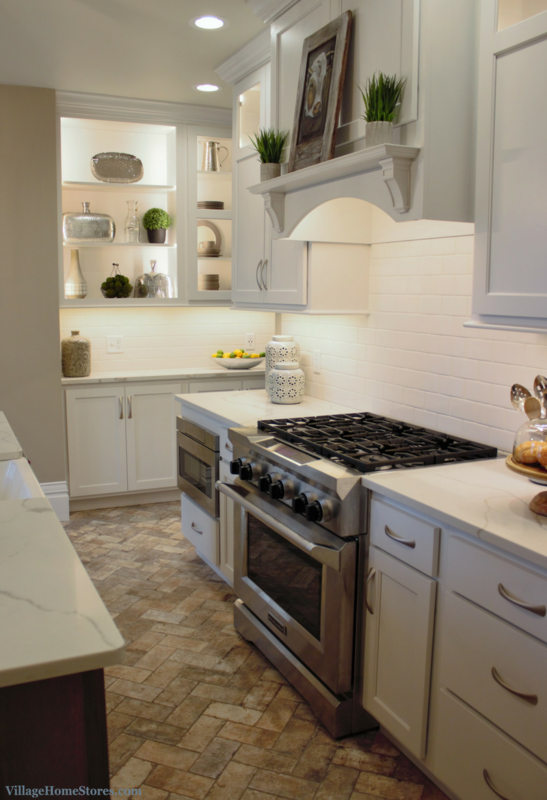 The original kitchen was a medium tone wood and crowded by a small peninsula area. 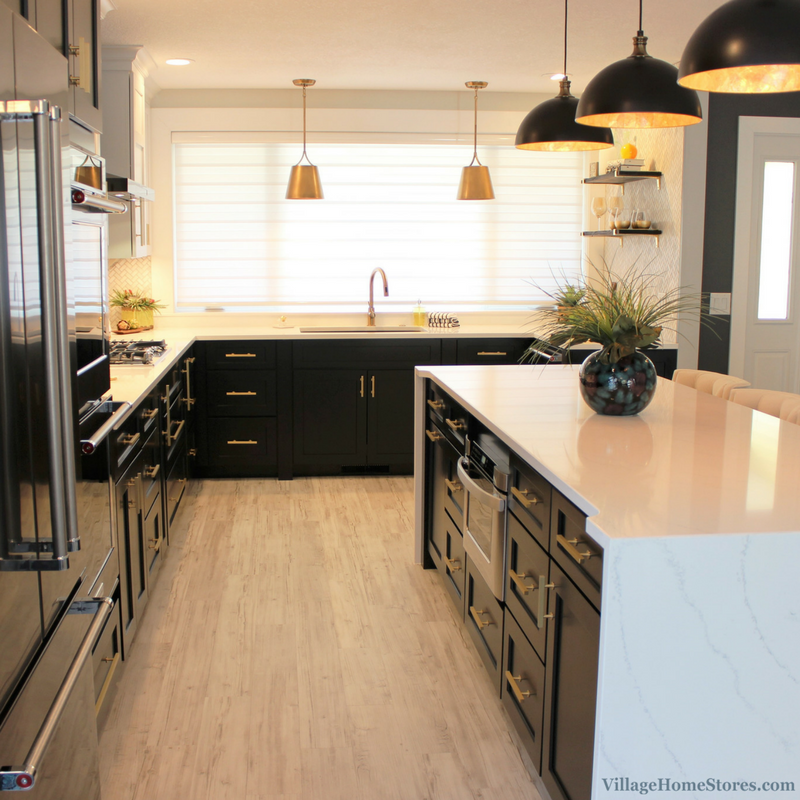 The new kitchen is bright and beautiful. 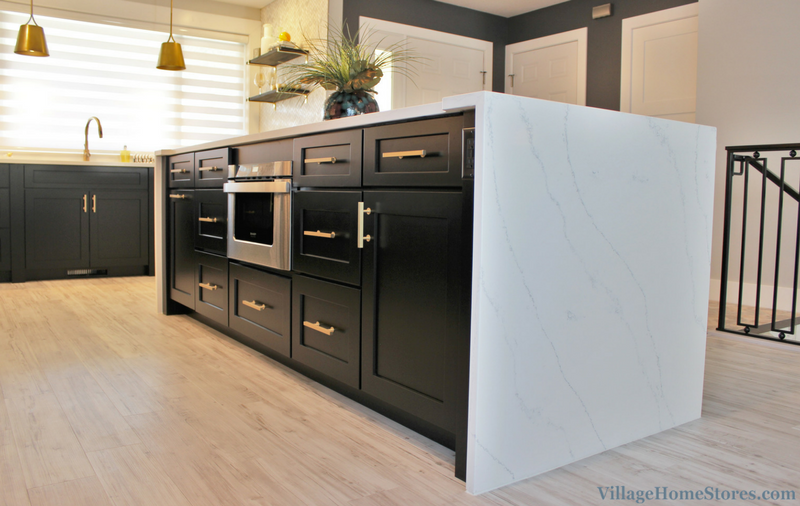 Painted cabinetry from our Koch Classic line in the “Prairie” door and “Pearl” finish is paired with “Chakra Beige” quartz counters. 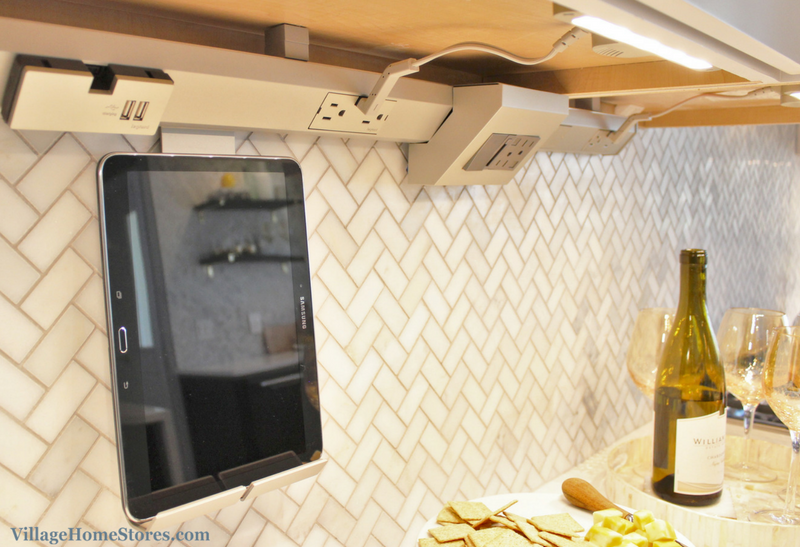 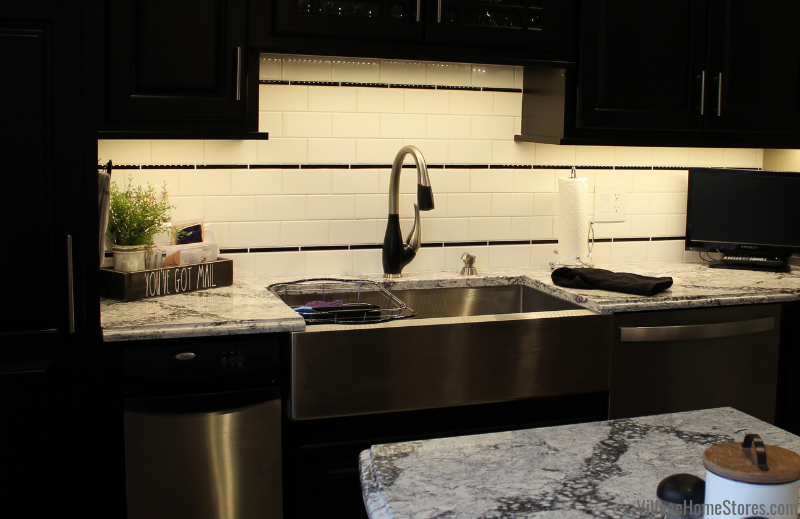 Not only is the kitchen light and bright, its packed with smart storage solutions! 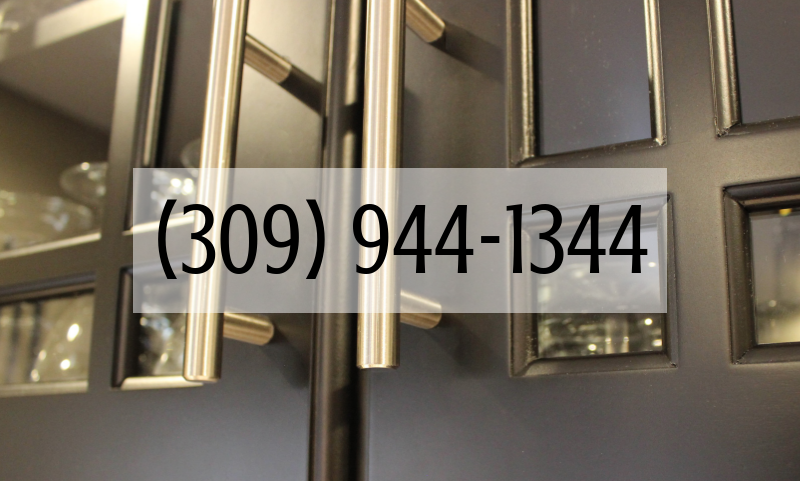 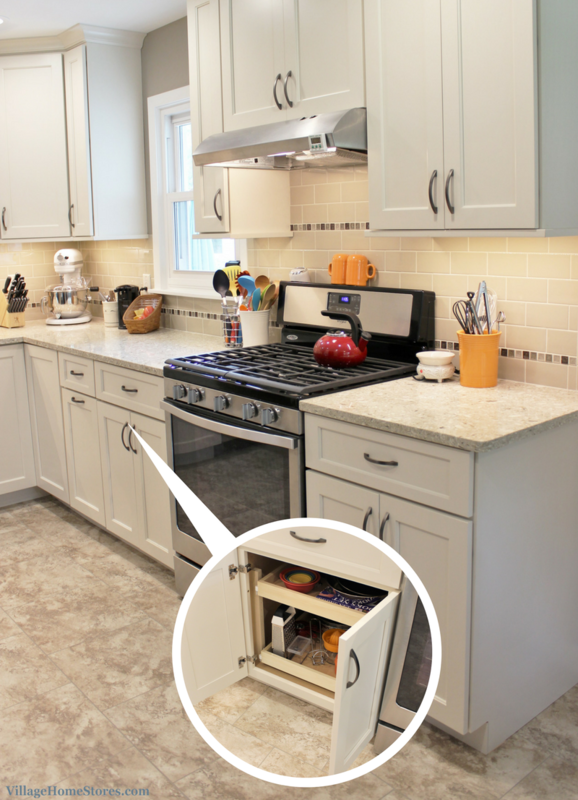 Behind any of the base cabinet doors you can find adjustable slide-out shelving to help easily utilize every inch of cabinet space. 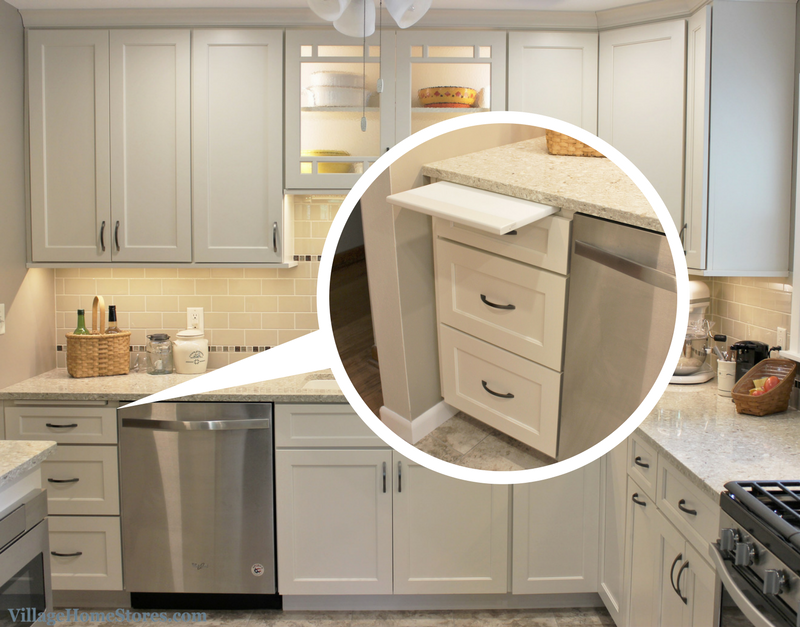 Of course the corner cabinet includes a lazy susan for the best way to access the corner. 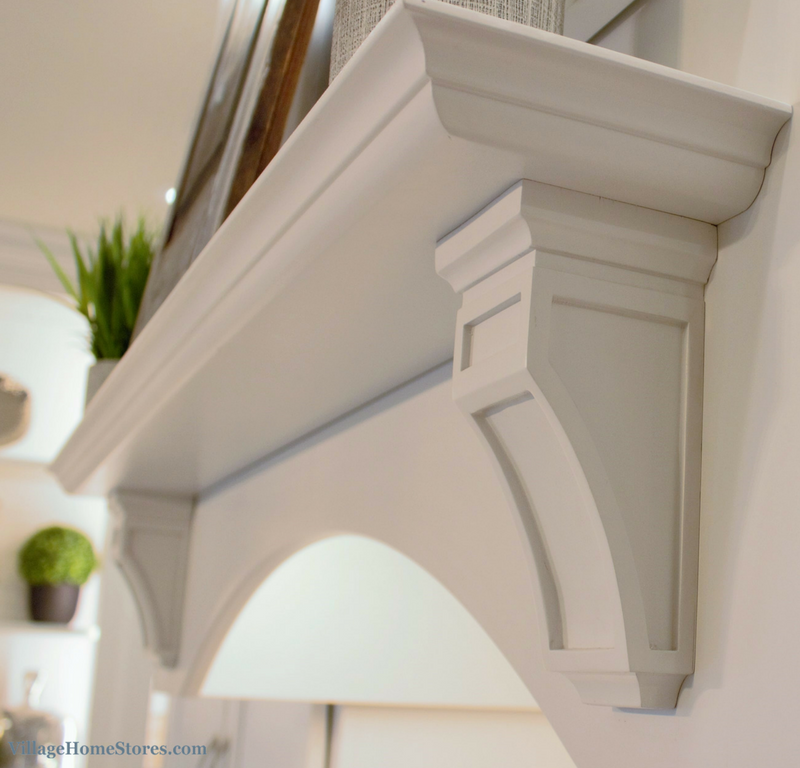 This style of susan is called an “all wood susan” or “super susan” style. 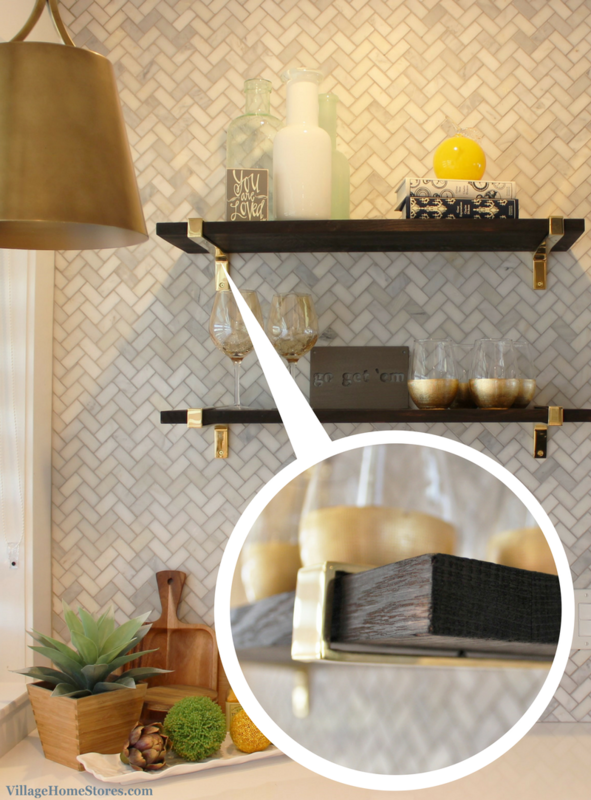 A fixed center shelf with a susan tray attached allows a sturdy construction. 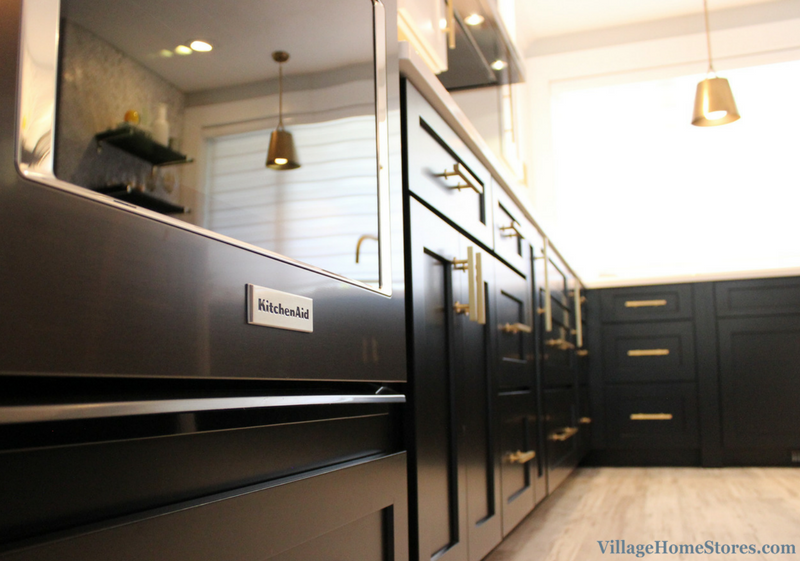 Not only are there special inserts in the cabinetry, there are some custom additions. 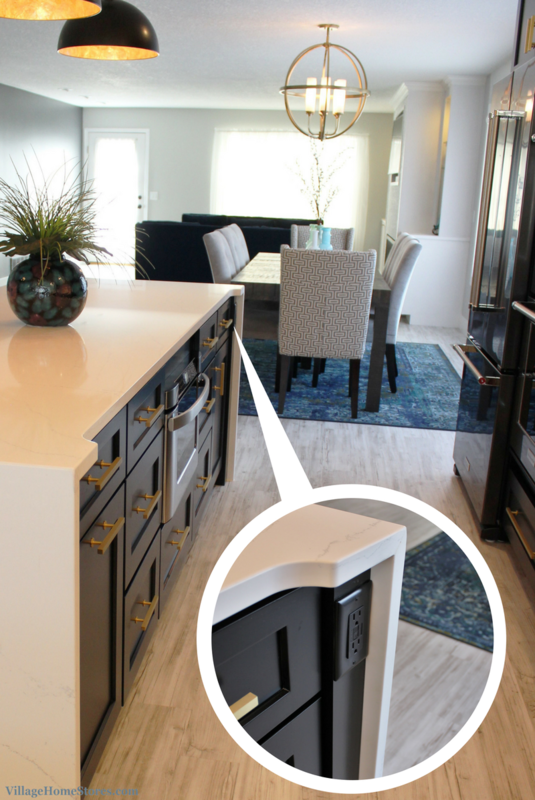 The stack of drawers to the left of the dishwasher includes a pullout cutting board. 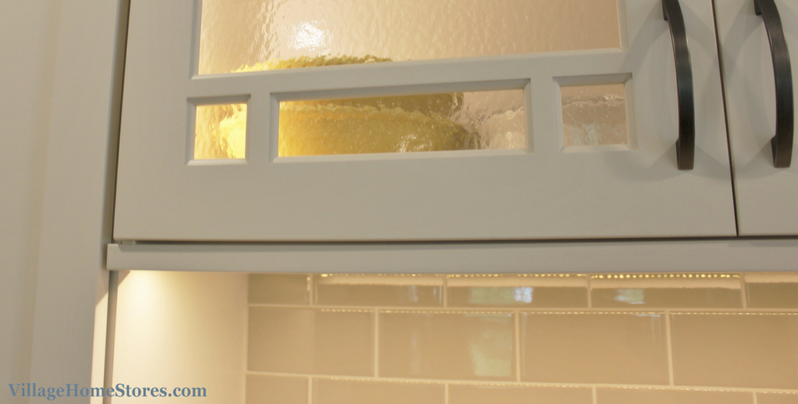 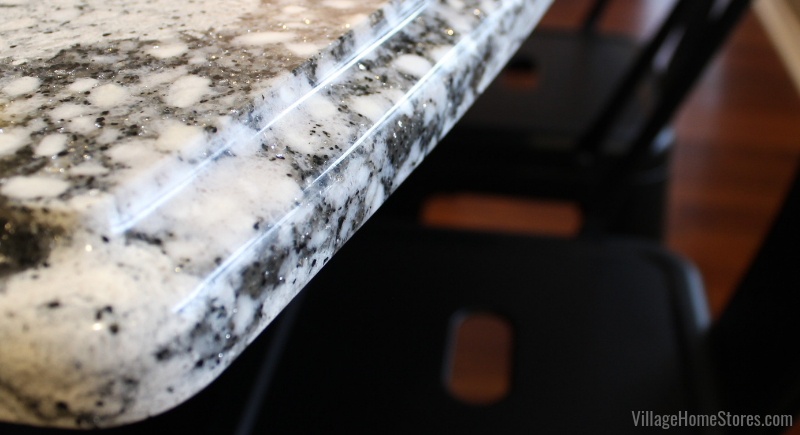 This option is a wonderful feature to add to your kitchen space. 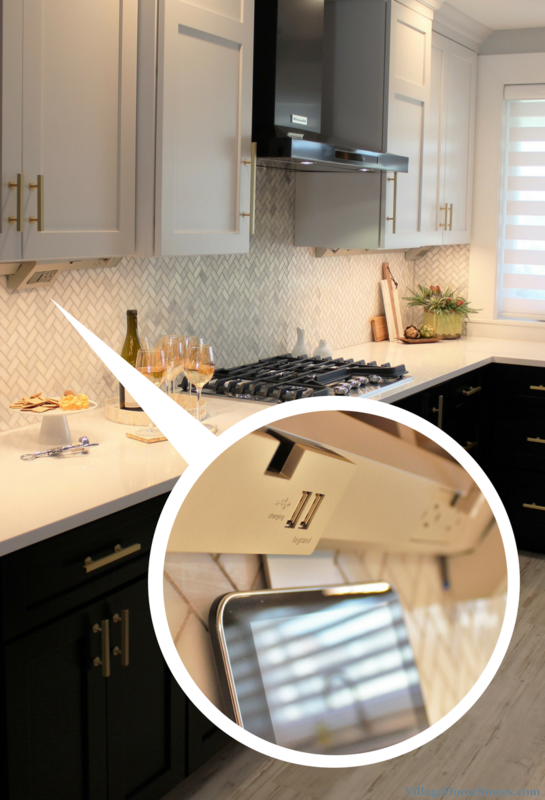 The cutting board can be removed completely for use or cleaning. 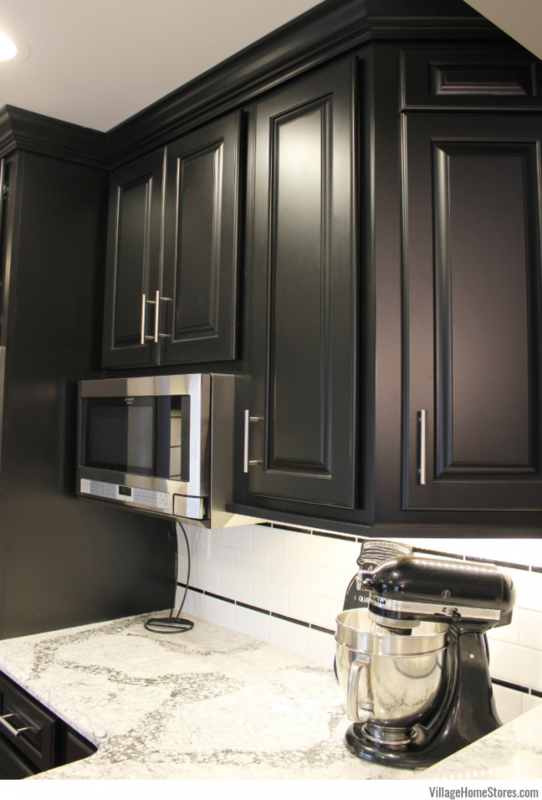 We love the coffee station in the new kitchen. 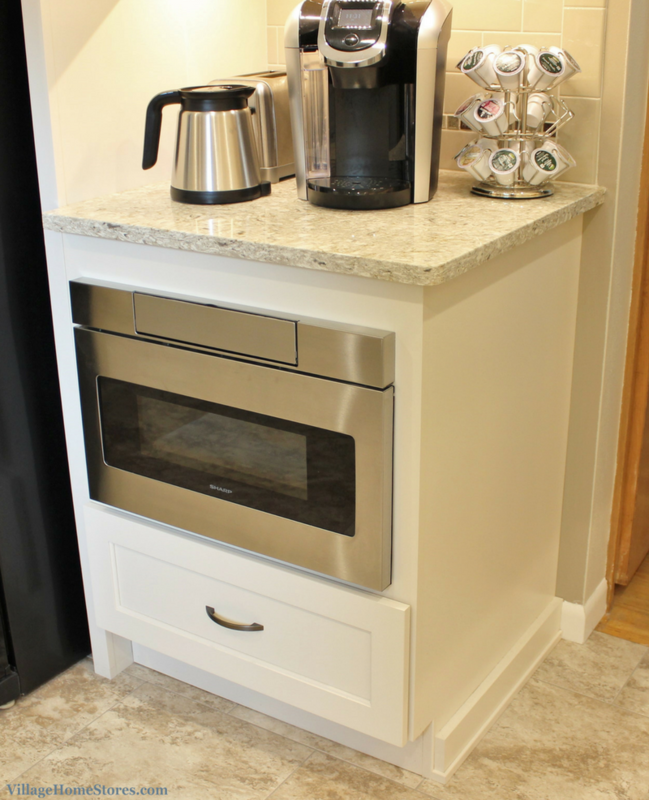 This area near the refrigerator is the perfect breakfast station including coffee and the toaster. 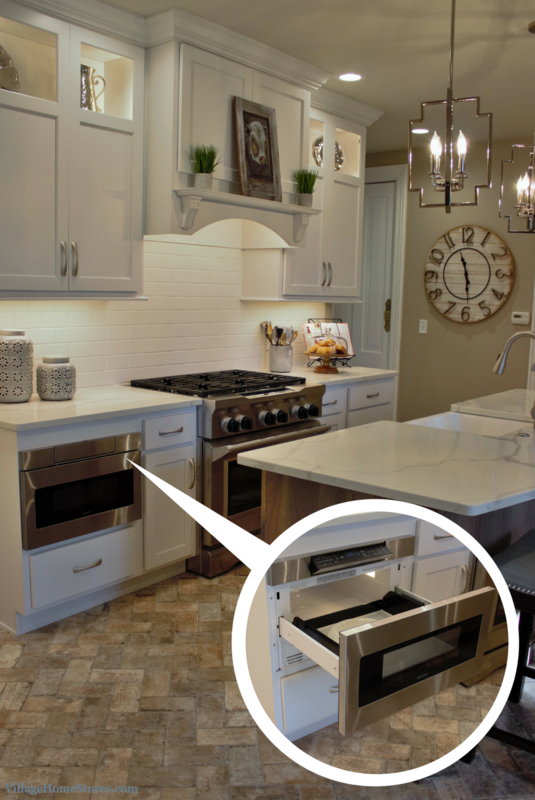 Below the counter is a Stainless Steel microwave drawer. 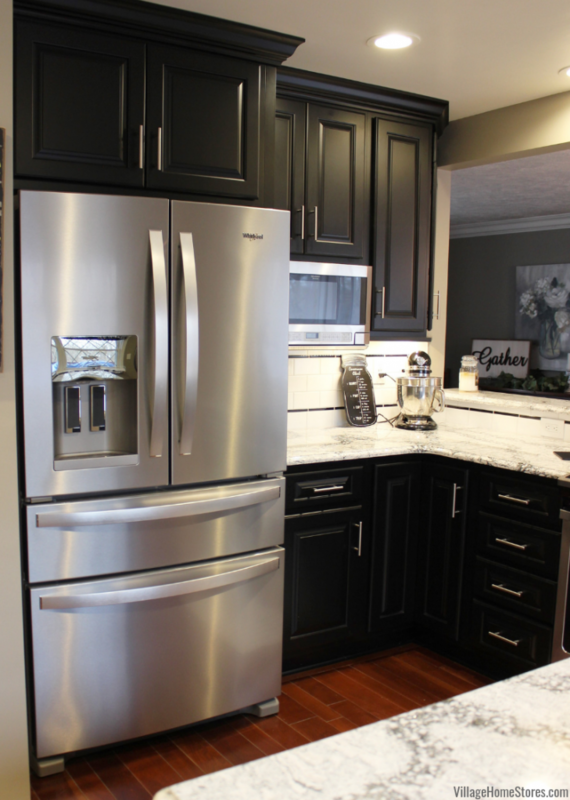 This 24″ wide unit from Sharp has a flip out front control and blends well with many appliance brands and styles. 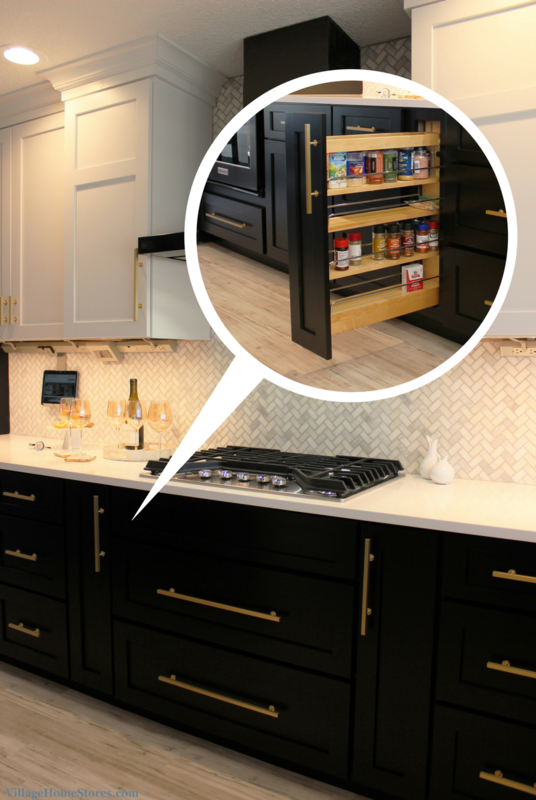 Of course a tall and wide pantry is the fastest way to add great storage to a kitchen. 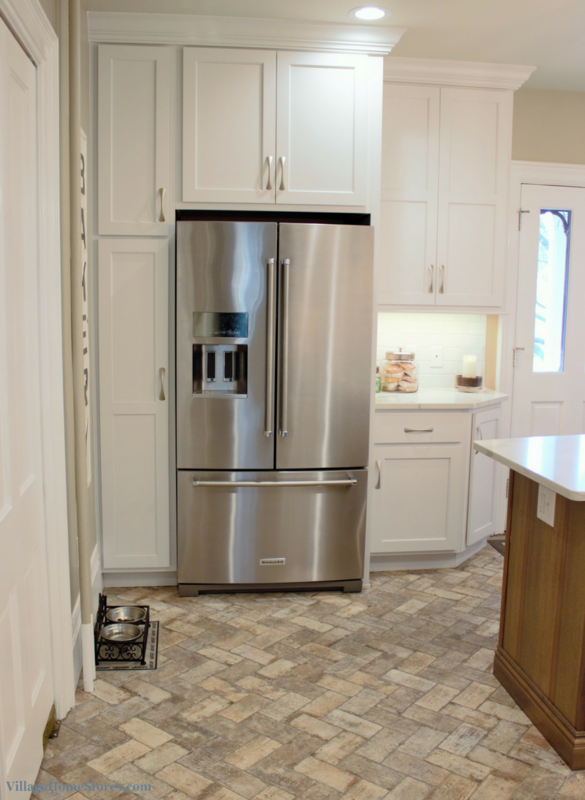 This new layout includes a large pantry with slide-out shelves. 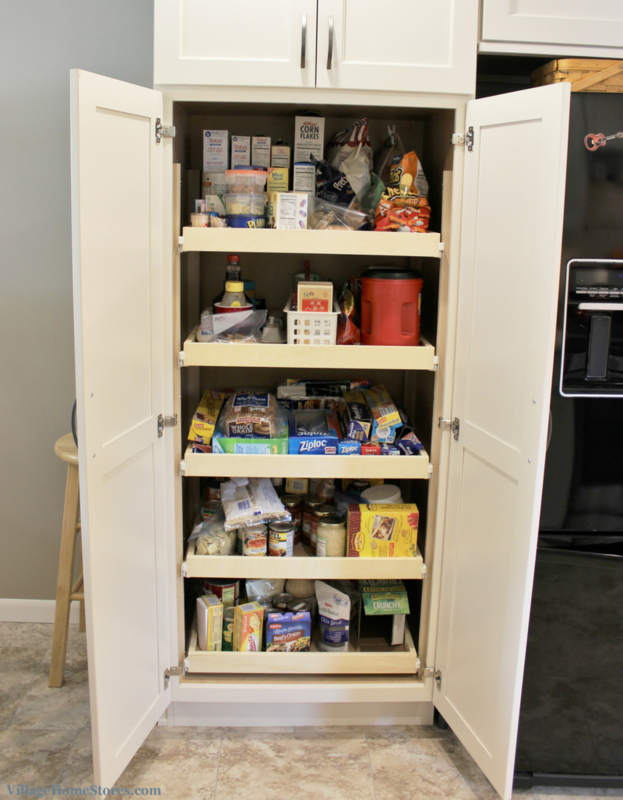 Now pantry storage items are within reach of fresh food storage. 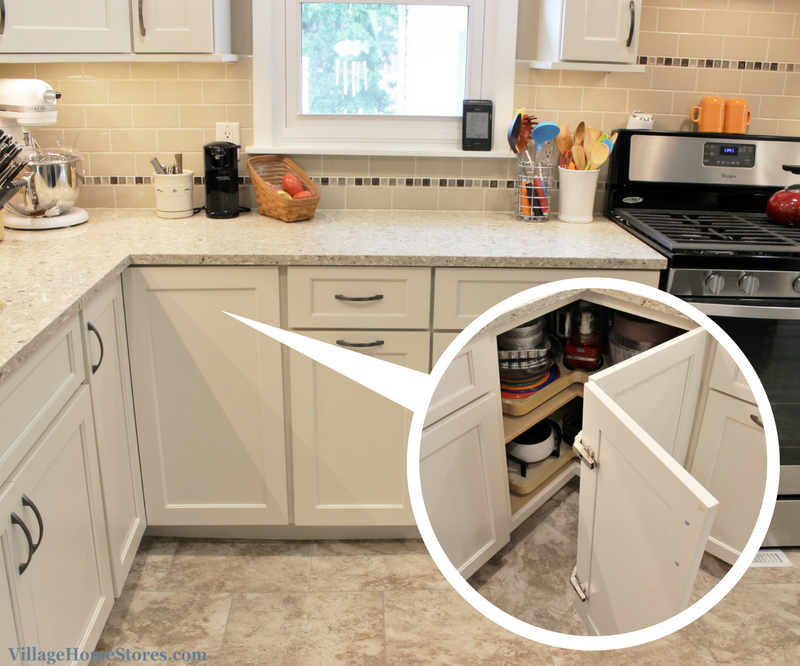 Keeping this tall pantry next to the refrigerator helps to keep the rest of the kitchen seem less crowded and more open. 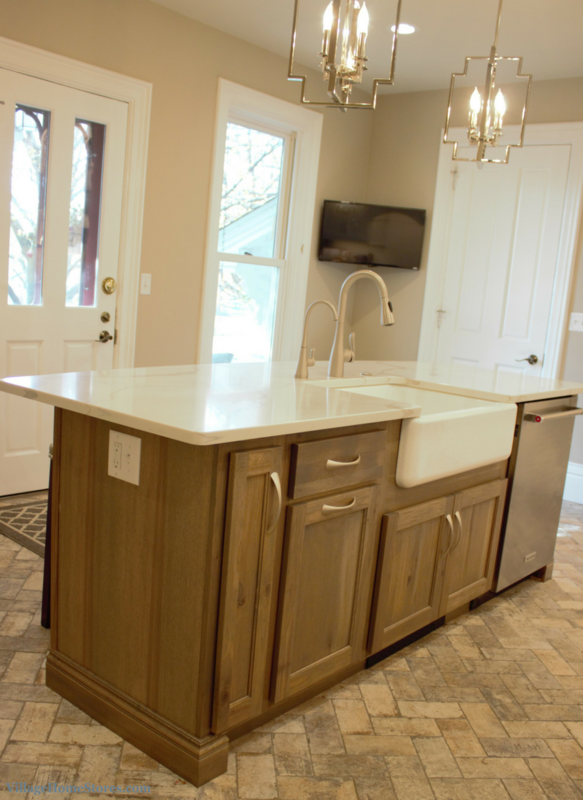 Not every kitchen design includes the kitchen sink beneath a window. 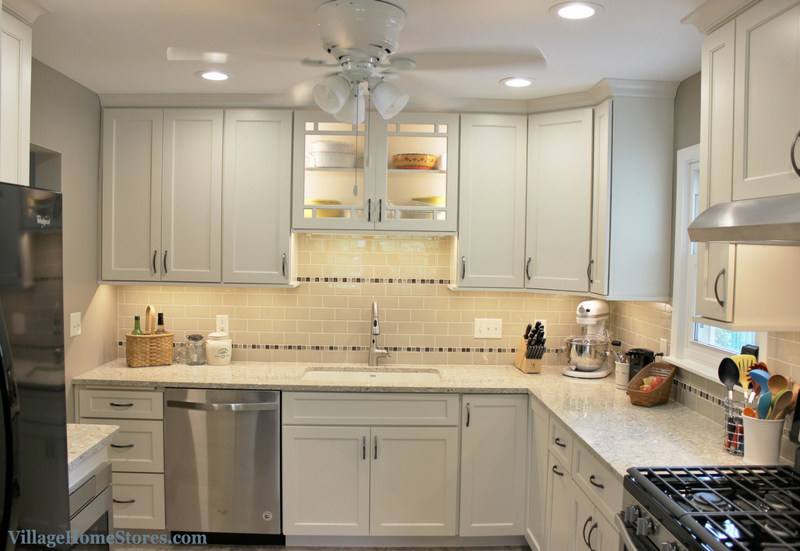 In this case, the sink area has been accented with a lighted glass-front cabinet above and a tile accent. 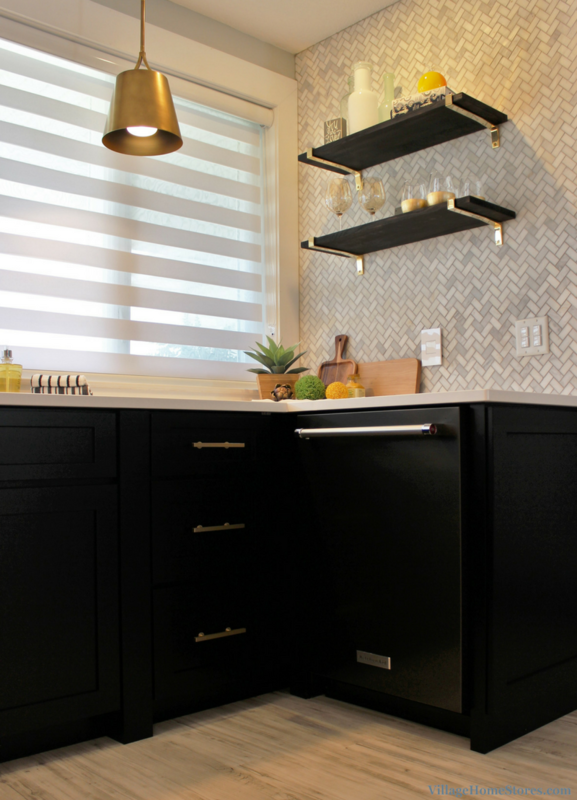 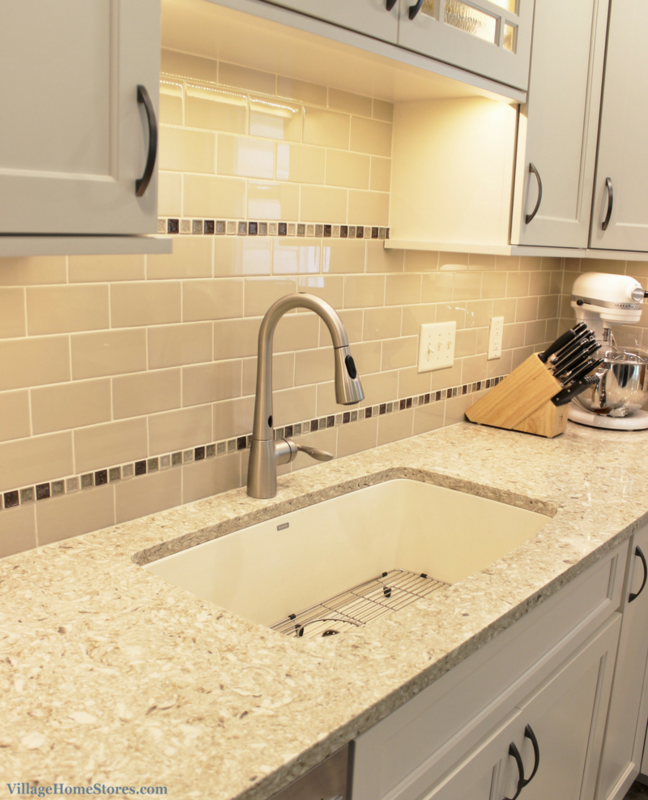 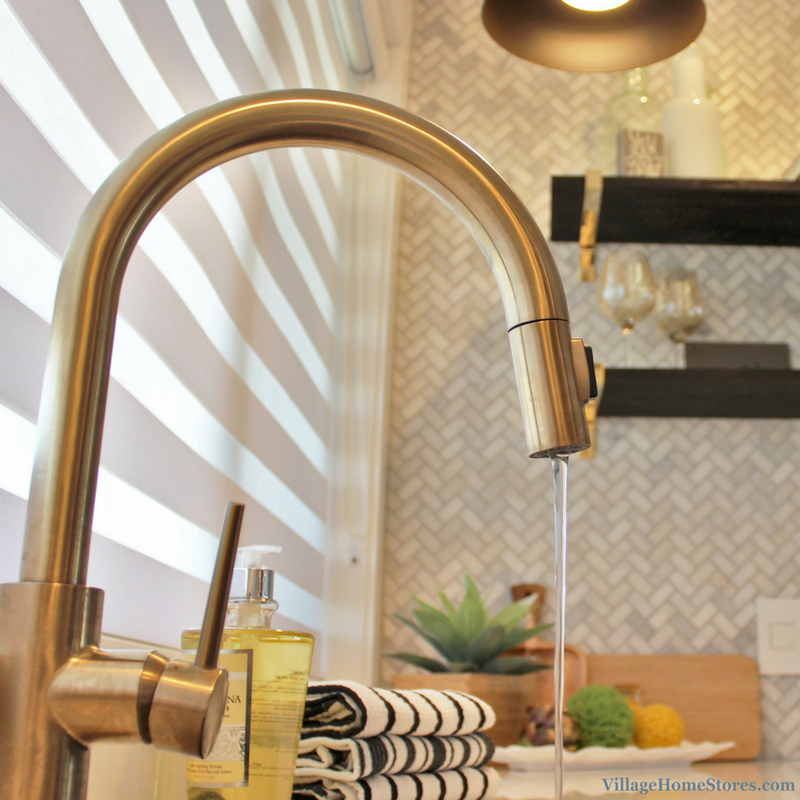 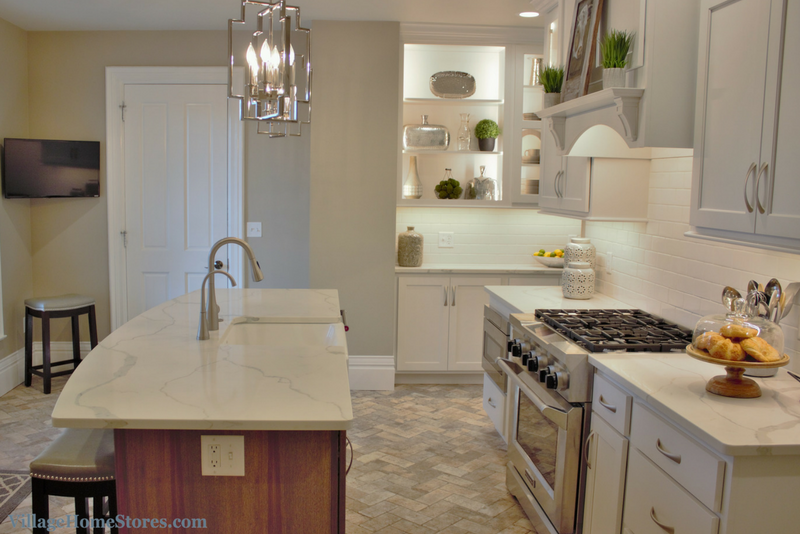 The Soho 3′ x 6″ Subway Tile in “Linen” color and glossy finish is accented with a strip of glass mosaic. 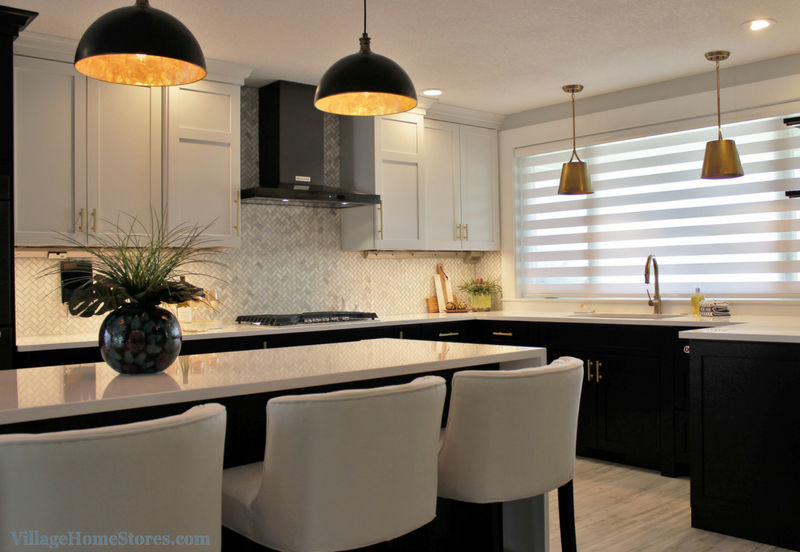 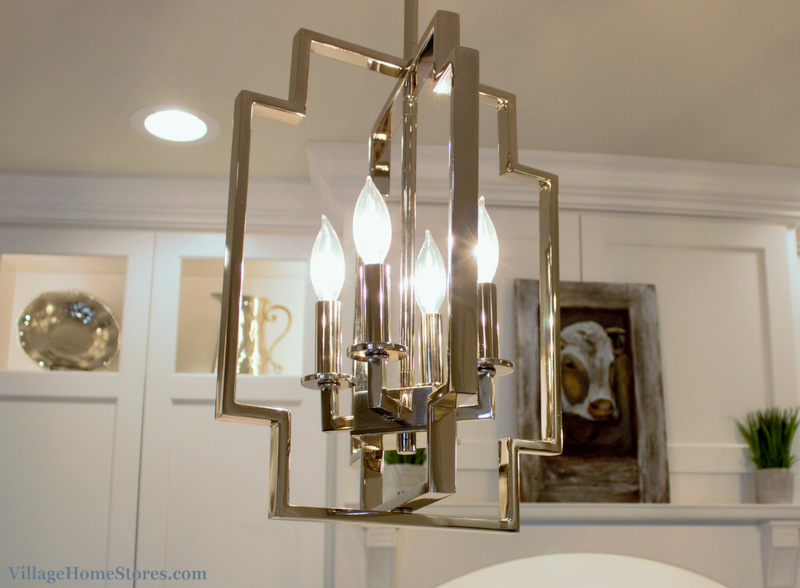 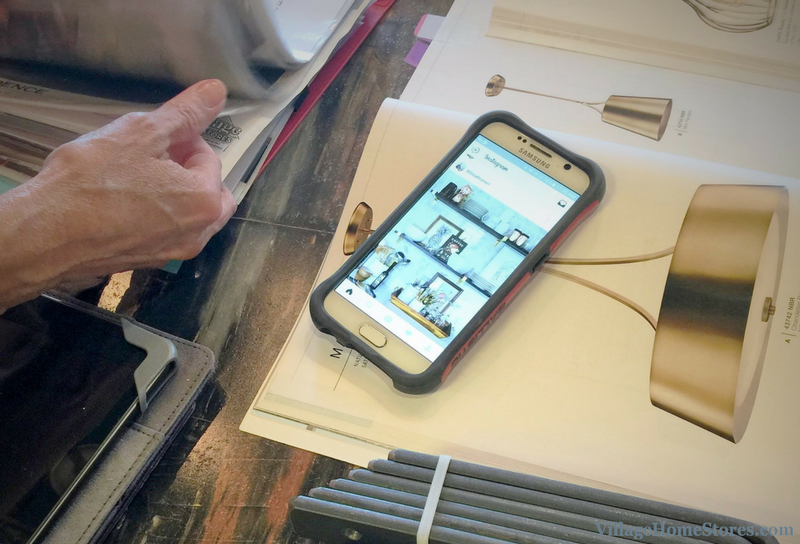 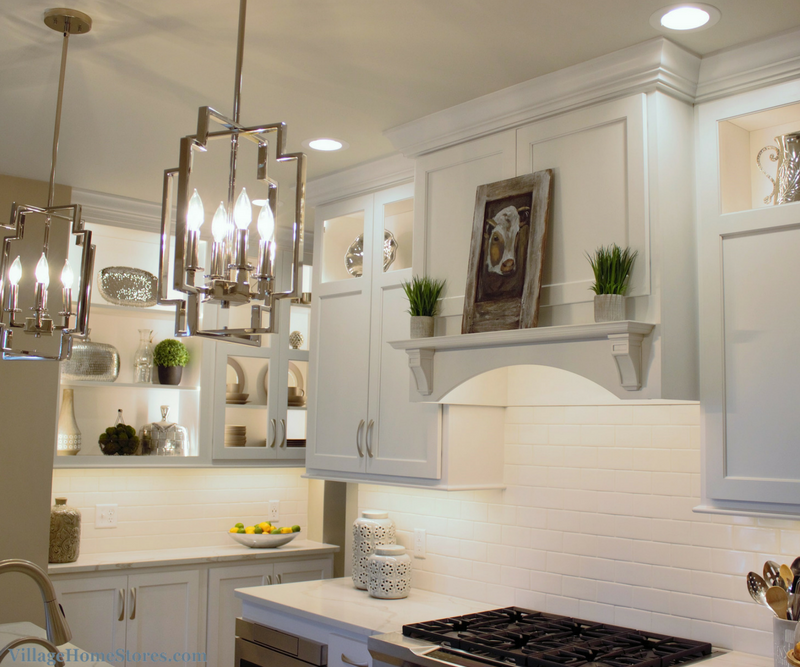 Adding a lighting plan to this new kitchen also help brighten the space dramatically! 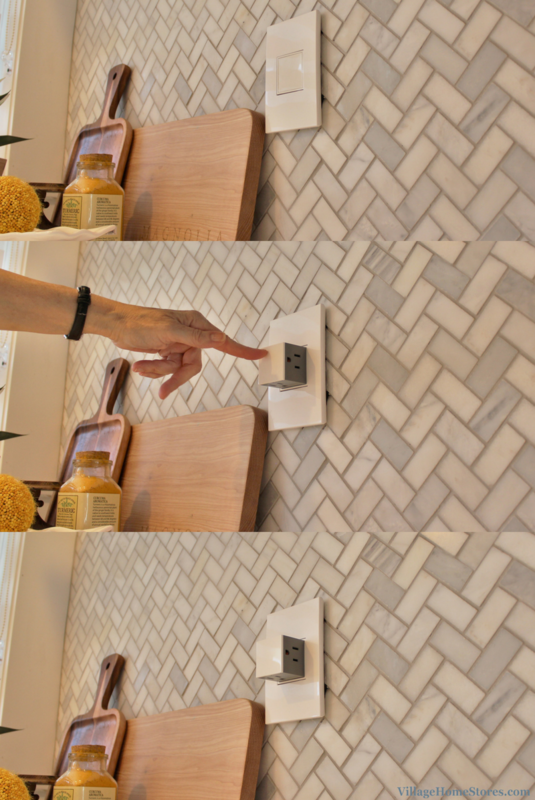 Not only are there recess cans throughout, but also a lighted ceiling fan. 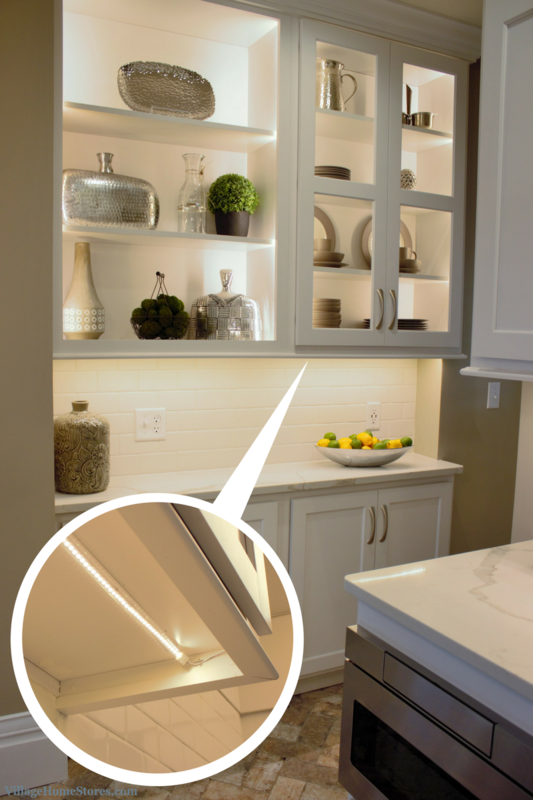 Our Diode LED undercabinet lighting system is installed underneath the cabinetry and also inside the glass-front cabinets. 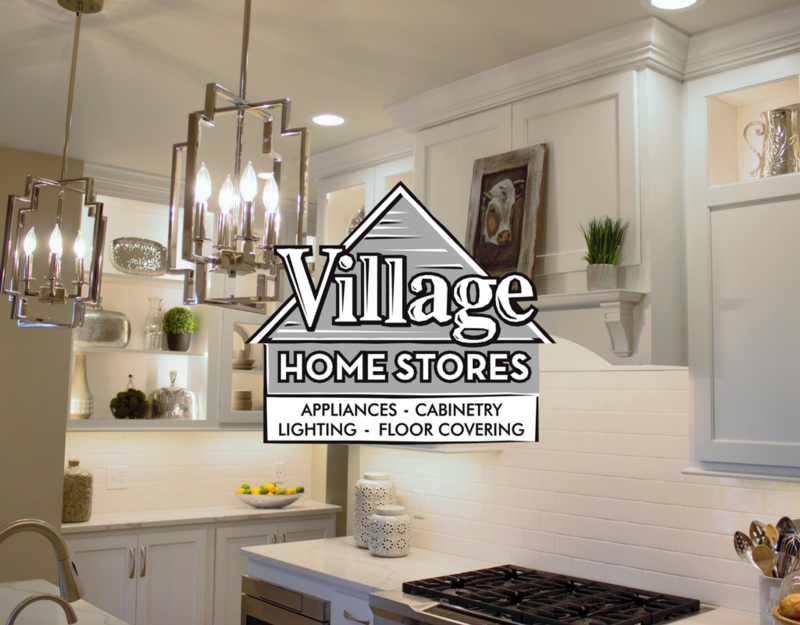 This low-profile and low-voltage light system is always a favorite feature for those that have it! 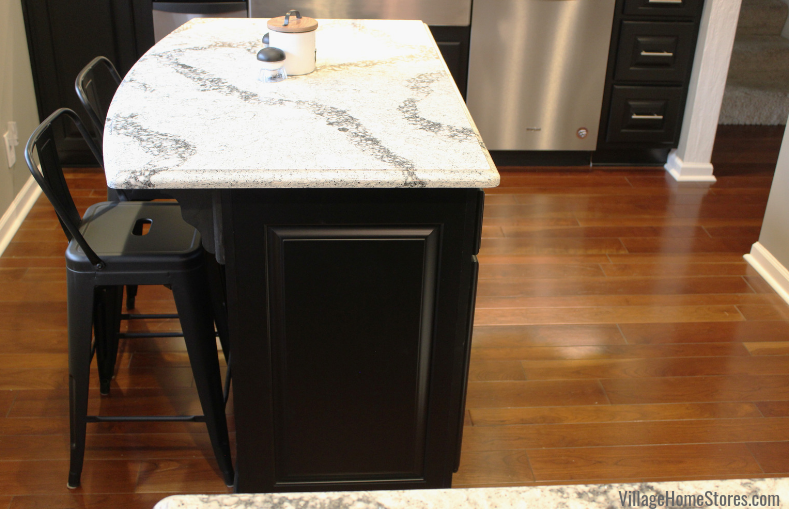 The casual dine-in area on the end of the kitchen has just enough room for a small round table and chairs. 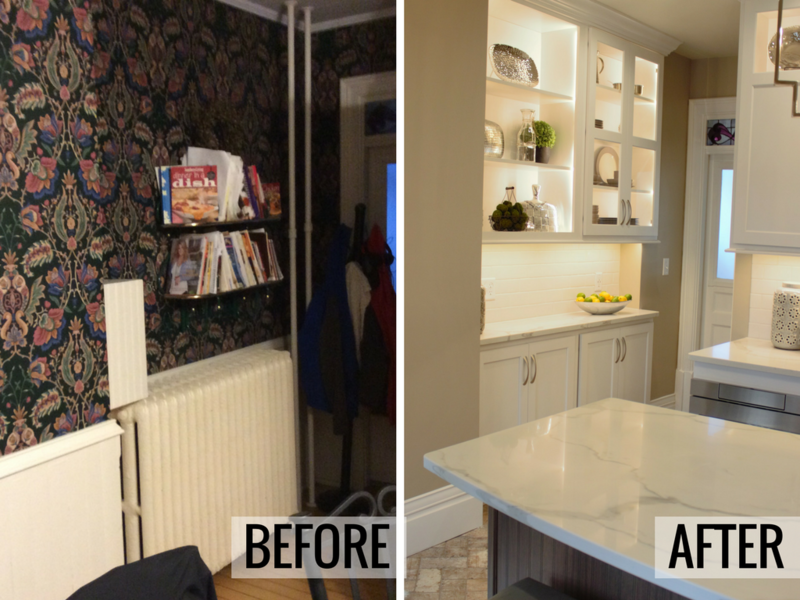 Instead of a shallow tv stand, this client asked to have a custom hutch area created to match the new kitchen. 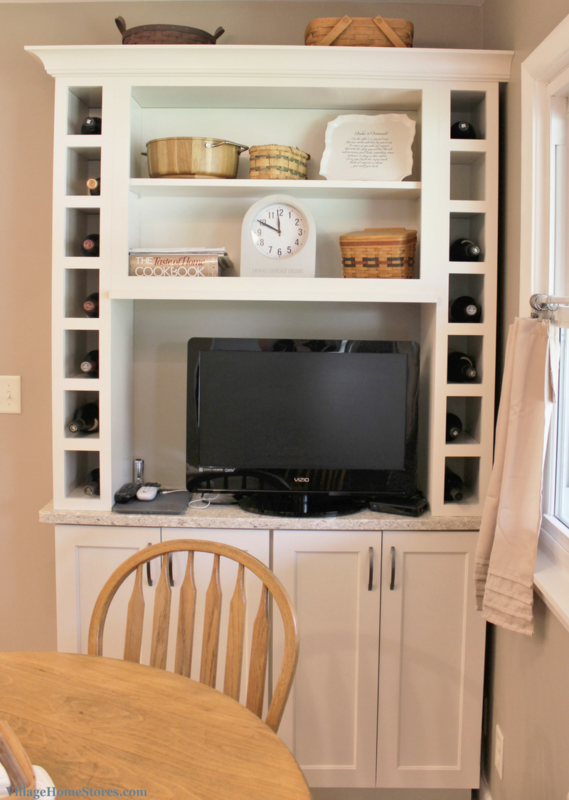 Not only is there plenty of space for a TV but also display space, storage below and even wine cubbies on each end! 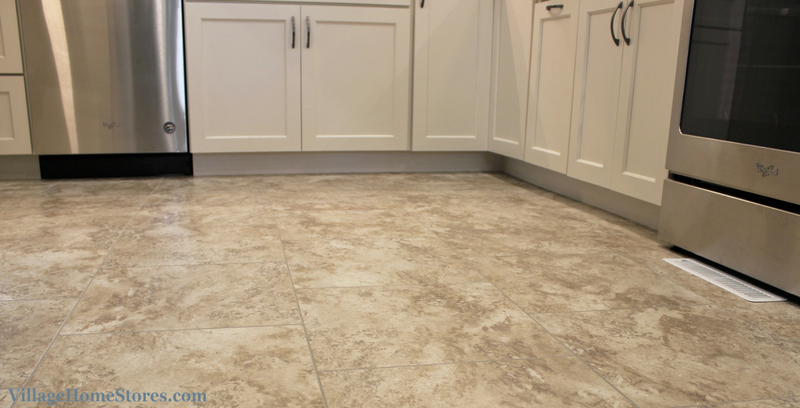 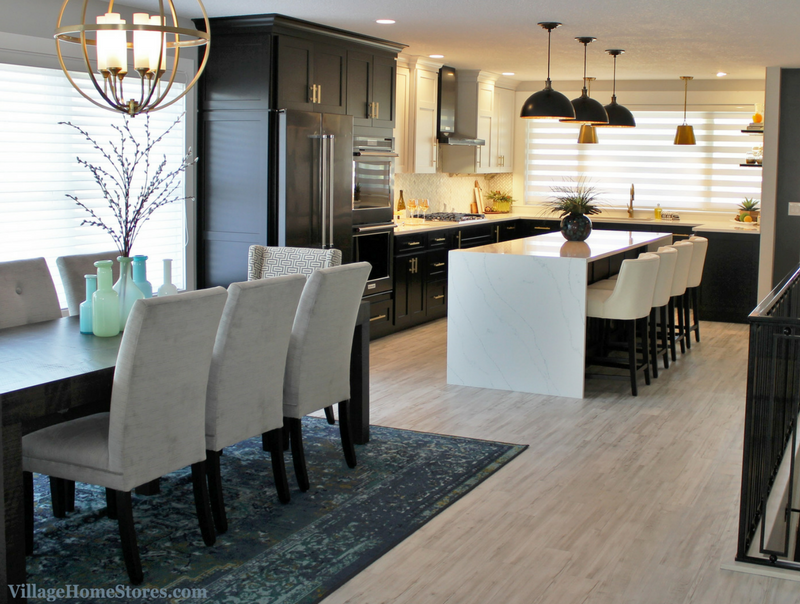 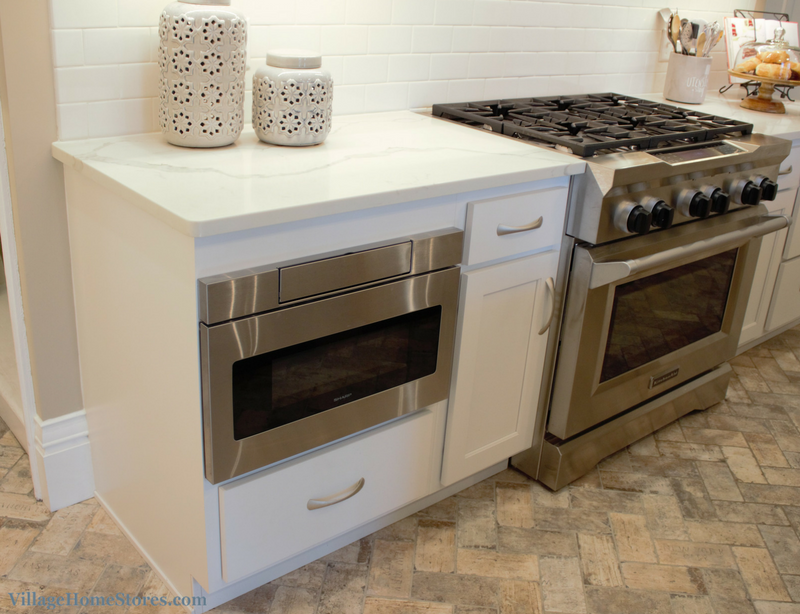 This beautiful new bright kitchen all sits atop a new Luxury Vinyl Floor from the Tarkett Permastone series in Travertine “Weathered Beach” color. 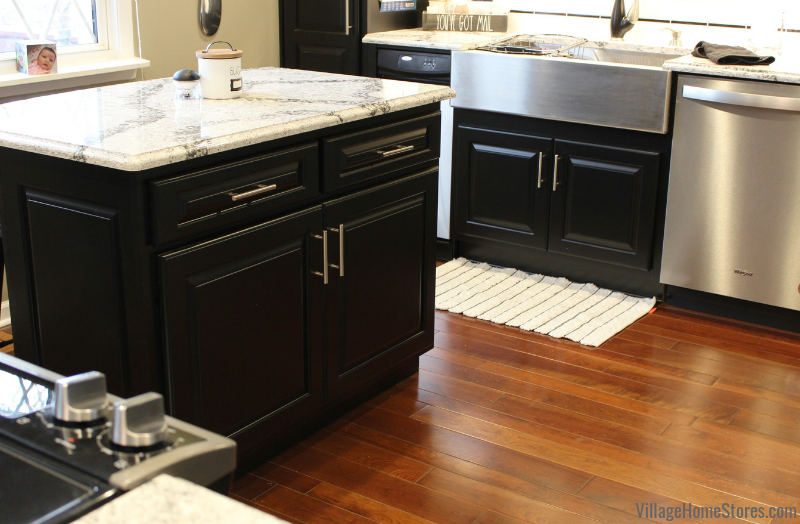 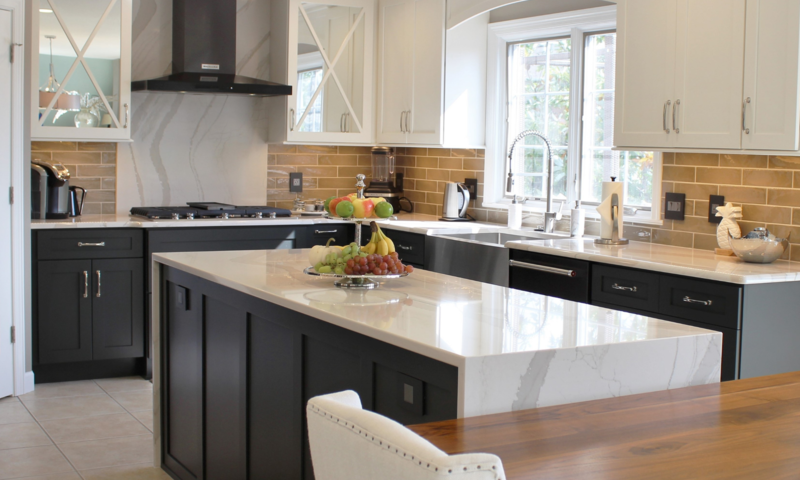 LVT is a durable product with many benefits for kitchen applications. 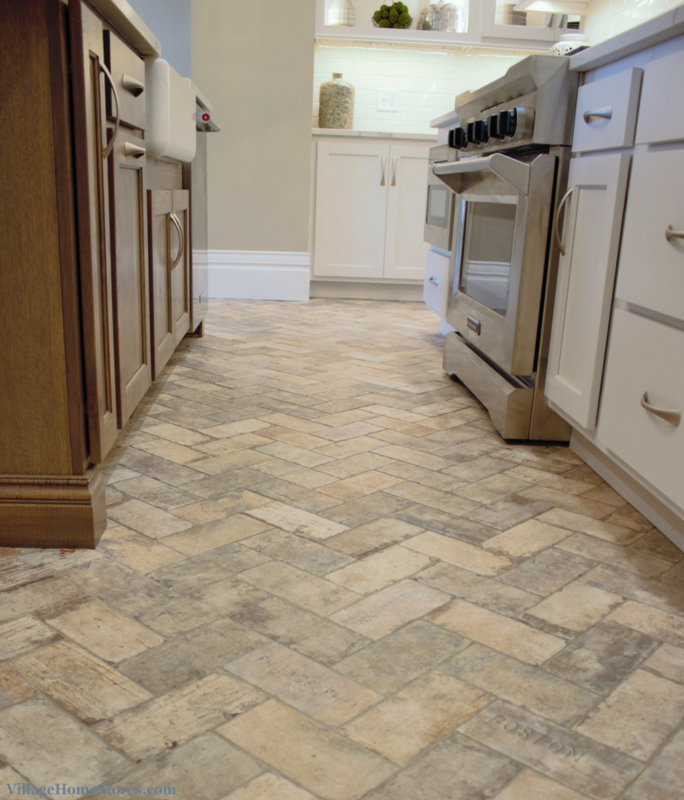 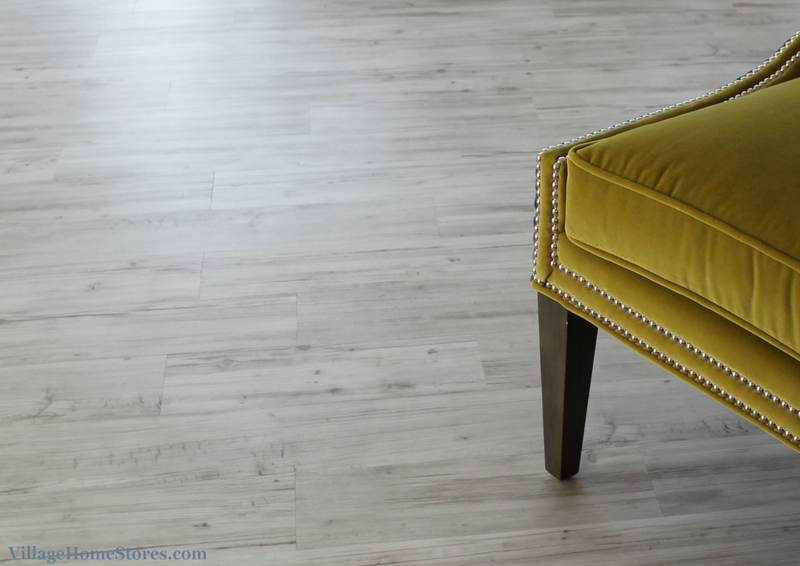 Call or stop by today to speak to one of our flooring experts about LVT in your home. 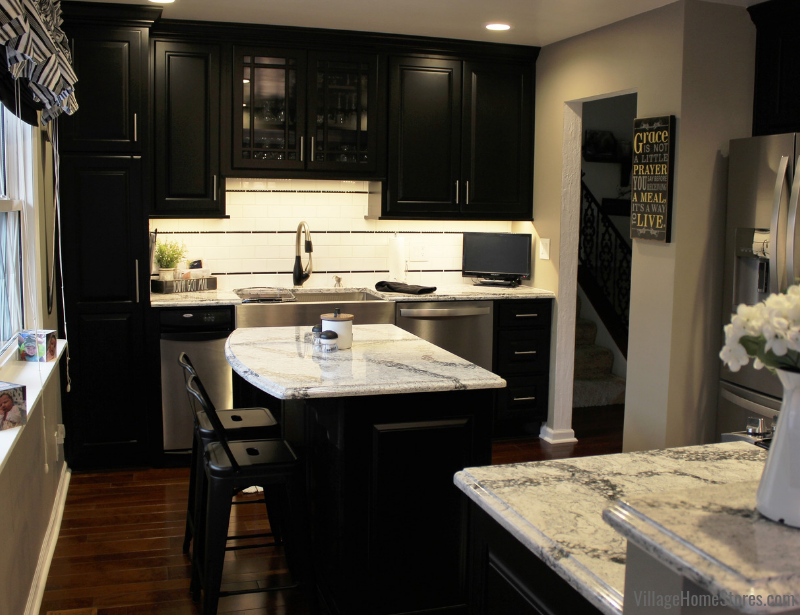 Curious what potential your current kitchen space may have? 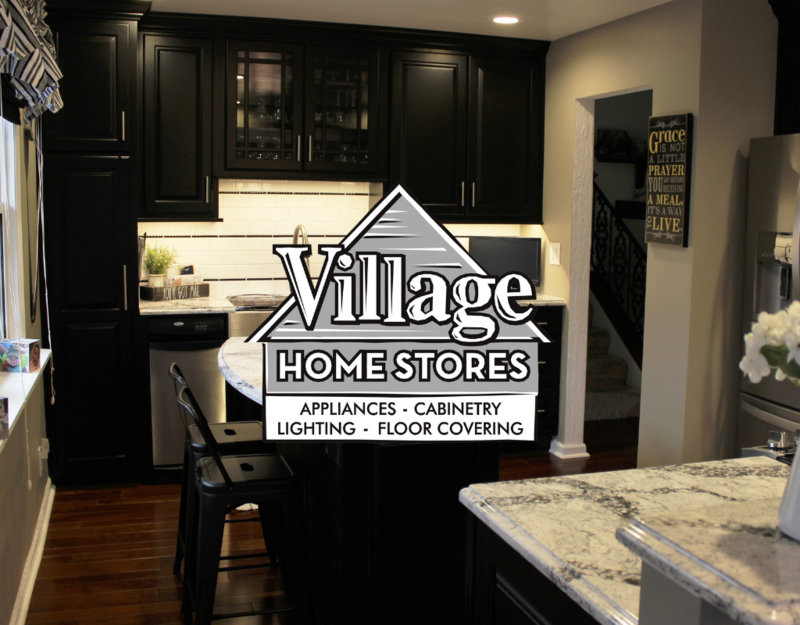 We can’t wait to help show you! 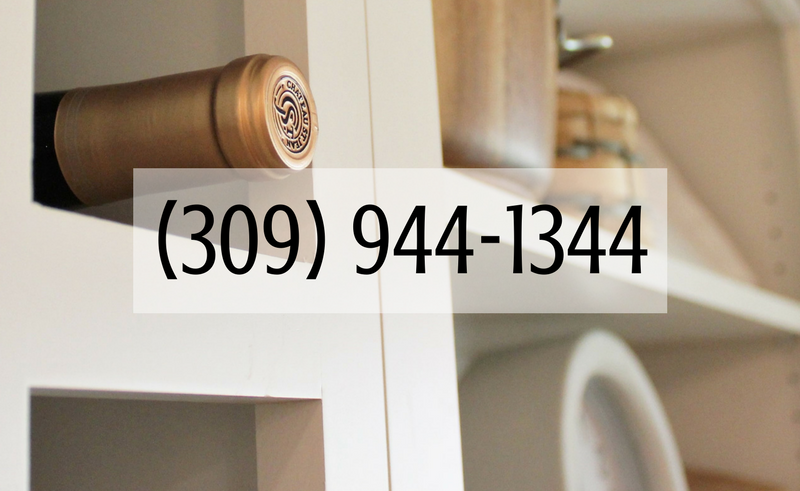 Contact us today to start the conversation about your project. 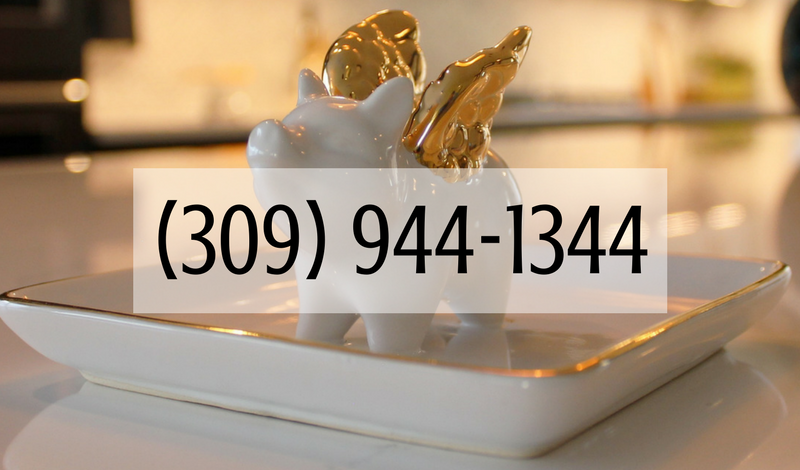 Complete this short online form or call us at (309) 944-1344. 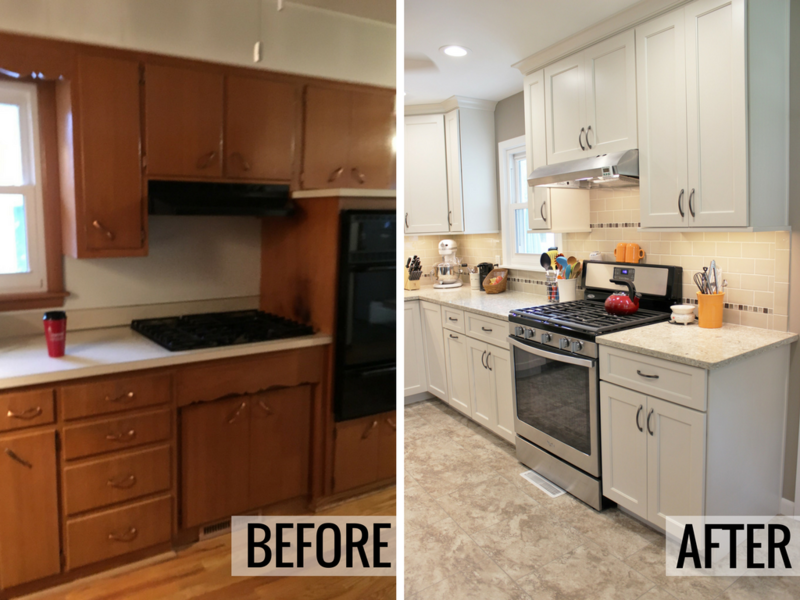 See the full album of photos from this kitchen remodel project over on our award-wining Houzz page here.